Celebrate a birthday or any special occasion with this moist and scrumptious Vanilla Birthday Cake. Don't forget the Caramel Pastry Cream! You might also like Anna Olson's Best-Ever Cake Recipes. 1. For the cake preheat the oven to 350 F. Grease two 8-inch round cake pans. Line the bottom of each pan with parchment paper and then flour the sides of the pans, tapping out any excess. 2. Using electric beaters or a stand mixer fitted with the paddle attachment, beat the butter and sugar until fluffy, then add the eggs one at a time, beating well after each addition. Stir in the vanilla. 3. In a separate bowl, sift the flour, baking powder, baking soda and salt. Add this alternately with the buttermilk, starting and ending with the flour and mixing well after each addition. Divide the batter evenly between the 2 pans. 4. Bake the cakes for 25 to 35 minutes, or until a tester inserted in the centre of the cake comes out clean. Cool the cakes for 20 minutes in their pans, then carefully turn out to cool completely on a rack. 1. For the caramel pastry cream, bring the water, sugar and corn syrup to a full boil in a medium saucepot. Boil, uncovered and without stirring, occasionally brushing the sides of the pot with water, until it is a light amber colour. Whisk in the cream gradually (take care for the steam) until fully incorporated, and cool to room temperature. Whisk 1/3 cup of the caramel sauce into the pastry cream and chill until ready to assemble. 1. 1. Heat the milk with the scraped seeds of the vanilla bean or the vanilla bean paste until just below a simmer. 2. 2. In a separate bowl, whisk the egg yolks, sugar and cornstarch. Ready a bowl with the butter, placing a strainer on top of it. 3. 3. Gradually whisk the hot milk into egg mixture and then return it all to the pot. Whisk this constantly (switching to a spatula now and again, to get into the corners) over medium heat until thickened and glossy, about 2 minutes. Pour this immediately through the strainer, whisking it through if needed, and stir in the butter. Place a piece of plastic wrap directly over the surface of the custard, cool to room temperature and then chill completely until ready to use. 4. The pastry cream will keep up to 4 days refrigerated. 5. Used in conjunction with other listed ingredients to make the Caramel Pastry Cream. 1. For the frosting, use a stand mixer fitted with the paddle attachment or using electric beaters, beat the butter until it is fluffy, Add 2 cups of the icing sugar and first beat on low speed to incorporate, then increase the speed to high, until fluffy. Add the milk and vanilla and beat in. Add the remaining 2 cups of icing sugar and beat in, adding further up to 6 cups until a fluffy and spreadable consistency is achieved (the softness of your butter when you begin is the reason you may have to make this adjustment). 2. To assemble, place the first cake layer on a plate or platter. Fill a piping bag fitted with a plain tip with about a cup of frosting and pipe a ring around the outside of the cake (this prevents the pastry cream from seeping out). Scrape half of the caramel pastry cream into the centre of this and spread to level. Top this with the second cake layer, and spread a thin coating of frosting on the top and sides of the cake and chill for 20 minutes (this is the crumb coat). 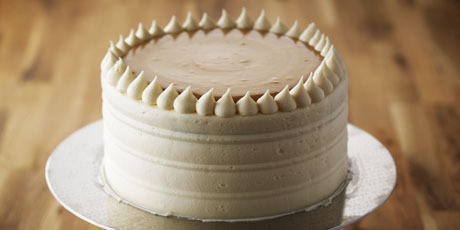 Now completely coat the top and sides of the cake with frosting and level until smooth. Using a pastry bag fitted with a piping tip of your choice, pipe a design on the top edge of the cake. Stir the remaining caramel sauce into the remaining half of the caramel pastry cream and spread this on the top of the cake. Chill until ready to serve. 3. The cake can be made up to a day in advance and stored, refrigerated until ready to serve.